Rating - 4 out of 5: I really liked it! This is not a ghost story even though there are plenty of ghosts in it. And it's not a horror story though some people might be horrified. It's not a monster story either, even though there is a monster in it and that monster happens to be me. From the author of the critically-acclaimed Tall Story, comes a haunting, intense and moving novel which weaves myths and ghosts into a modern setting. As Rosa's social life blossoms, how will she seize the freedom to be who she really is? My Thoughts - When I first got this book through the post I have to admit that I was very intrigued by the premise. I don't usually like ghost stories, and I wouldn't really say that this is a ghost story to be honest, but I was intrigued about how a young girl who is obviously seen as a monster by society is forced to live out her life online, and how her relationship with this Ansel95 would develop. Admittedly, there wasn't as much about her online friendships as I was hoping and it only really took up a small portion of the book, but I still found it really enjoyable and I read it in just one day as I wasn't able to put it down. Instead, Shine focuses on Rosa's life on a very small island whose population all seem to be incredibly superstitious. Rosa suffers from an illness known as the Calm, that leaves her with scarring and an inability to talk. As a result of this, she would be seen by the other people on the island as a monster and consequently lives her life in hiding. I have to say I found it completely shocking to see the level of fear and ignorance shown by the residents of Mirasol, and it was frightening to see the amount of hatred that they had for anybody with the Calm just because of an old ghost story. Throughout this telling of Rosa's story, there are also sections written by Rosa's mother in the form of letters to her twin sister. Rosa's mother also had the Calm but died when Rosa was just five years old, so these sections were a look into the past and what life was like for Rosa's mother growing up with a twin sister who was not affected by the illness. At first, I had trouble understanding what these sections were for, other than providing an interesting look at another person's viewpoint of the illness. However, near the end it suddenly all becomes clear how the past and present are linked in an amazing climax that I just hadn't seen coming. For the last few chapters I was literally unable to move until I found out how it would all turn out. Summary - A book that makes the reader think long and hard about superstitions, prejudices and how we treat people in general. 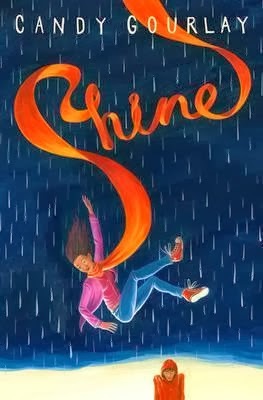 A YA book that is a must-read for people of all ages. Hey, I only just found this. Thank you so much for your thoughtful and wise review. I really appreciate it. Maddie sometimes guest blogs here!